Sweet Rot is extremely pleased to present the debut LP from Halifax, Nova Scotia’s Omma Cobba. Ranging from hyptnotic psych-garage ragers to mellow Sunday morning back porch 60s jams the sounds presented here clearly show a band focused on writing immediate and memorable songs. Formed from the ashes of Omon Ra, the band has already completed tours of Canada and the East Coast of the U.S. after having been banned from many of their hometown clubs. 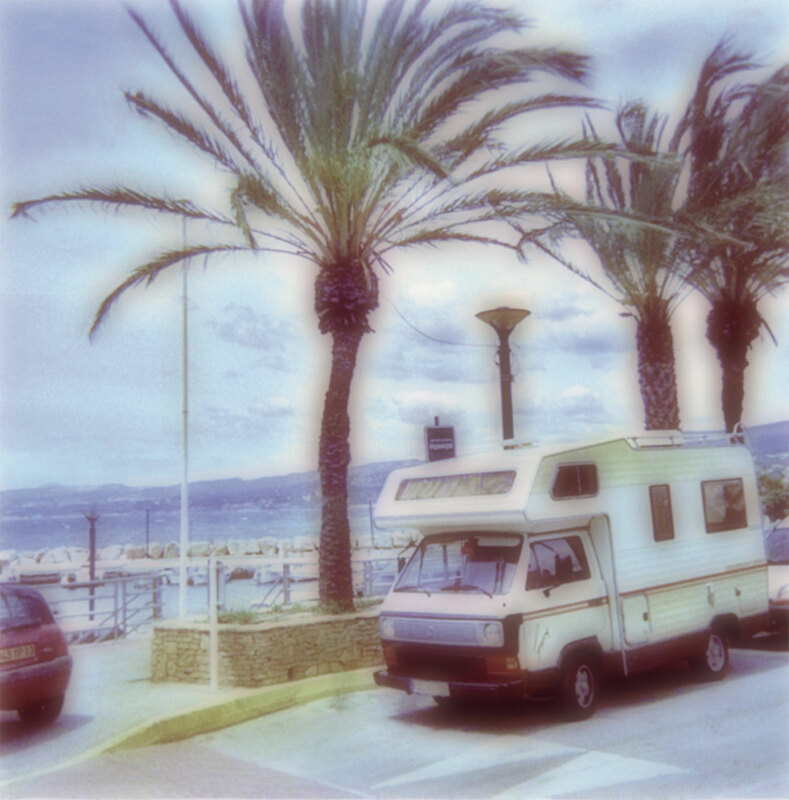 The eight songs on this LP were primarily recorded across a half dozen or so countries during a hazy trip to Europe in an old VW RV (pictured broken down in the south of France on the cover) which gives everything a solid reverbed out thump. For fans of Nerve City, Sic Alps, Fresh & Onlys, etc. Omma Cobba peaked some interests around these parts due to their connection with Canadian fuzzsters Omon Ra and an early single on Craft Singles. Now Dan Miller has taken Omma Cobba to the long format with an LP for Sweet Rot. Full of hangover blues and bedraggled folk maneuvers, the album rides the same Sic Alps/Skip Spence axis that showed up in early inklings. Recorded on the road in Europe; the album is soaked with the sound of road weary, late night rumblings that burn themselves clean under bare light bulbs in back rooms. Each listen peels away another layer from the toasted canvas of Miller’s songwriting and reveals the weary catharsis beneath his lo-fi film. As with most gems on Sweet Rot, this is limited (to 300) so hesitation will only leave you wanting more. Nova Scotian dude (from an earlier band called Omon Ra, which I’m sure I’ve seen mentioned somewhere) hits the stoned wave with a hazy, reverberating hippie folk-pop sound in the Sic Alps/Brightblack Morning Light mode of shambling, slurred guitar slack and obfuscated sentiments. My eyes rolled pretty hard when the needle dropped on this debut full-length, but truth be told, it’s a good effort, if painfully derivative of a few modern directions. “Policeman,” which was originally released as a single and repeated here, might justify checking this out altogether, where Dan Miller and his drumming compatriot line up the right chords, the proper chorus (an exhausted “Whoo-oo-oooh”), and the perfect attitude to bash this one and a couple of others here out of the rut so many who adhere to lo-fi tenets have faced. These eight songs were recorded around Europe during a tour, and sound pleasantly bedraggled, Spicoli-toasted, and generally better than expected. Give it time and you’ll enjoy this one as much as I do. Omma Cobba’s self-titled debut is so blurry and hazy you can barely read the track listing on the back cover. Working between the vague boundaries of blues, folk, and early rock, the Halifax-born Toronto-based band claims to have recorded most of its album in an RV while travelling across Europe. True or not, the reverb-drenched production and trails of echoing vocals do effortlessly evoke the mysteries of the open road. Most songs stick to the thump of a single drum accompanied by a maracca or tambourine, a sparse bass line rendered as a throb, and a few insistent guitar chords. Singer Dan Miller’s vocals provide variety, ranging from an effortless drawl on “Some People Say You’re No Good” to perfect wordless harmonies on “Policeman.” Omma Cobba channel half-remembered twangs and echoes into something filled with sadness and wonder, evoking the morose ballads of Japanese psychedelic group Les Rallizes Dénudés. The result is low-key, relaxed, and shockingly good.